After releasing the gold certified album 'The Lonely Position of Neutral' in 2002, Trust Company were unceremoniously pulled out of touring by the label to record the follow up 'True Parallels'. The writing and recording process was rushed, yet the album release was unbelievably delayed by ten months. After all the fuss Geffen chose rather oddly not to promote the album and although it achieved minor success through the one and only single 'Stronger', it failed to reach the heights of its predecessor. This signed the death knell for the band and a break ensued after they decided to leave the label. Prior to the bands reformation in 2007, vocalist Kevin Palmer and original bassist Josh Moates formed Amity Lane, who released the one album 'The Sound of Regret' during 2006. In essence this brand new album has been in the works for the last four years. A good majority of bands reforming simply go through the motions, failing miserably to replicate past glories after being offered large sums of money. Not so with 'Dreaming In Black And White'. Simply put, this is the bands best album to date. It retains everything that made Trust Company so successful and so unique; the whispered vocals, the crunching nu-metal style guitar riffs and the sugar sweet choruses. This time however the band has gone up a gear. Free from the shackles of Geffen's undoubted constraints and Howard Benson's slightly homogenized production, 'Dreaming In Black And White' is perhaps a true representation of who the band is. Producer Chuck Alkazian has given them their freedom back and as a result the chords are heavier the choruses hookier and the band happier. Belter of a first single 'Heart In My Hands' seduces and assaults the senses in equal measure, 'Almost There'- a metal anthem of melodic beauty, is an undoubted highlight, whilst 'Alone Again' a teasing balladic slow burner, illustrates a versatility not previously heard in the bands repertoire. Indeed almost every song on this album has something to commend it; the heavy grind of the title track, the majestic 'Skies Will Burn' or the harmony filled 'Don't Say Goodbye' all find Trust Company at the top of their game. 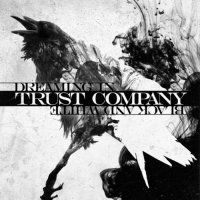 Heavy, melodic and unique - let's face it no one sounds like them -'Dreaming In Black And White' not only represents the pinnacle of the bands career, it also represents one of the best releases that 2011 has so far offered.